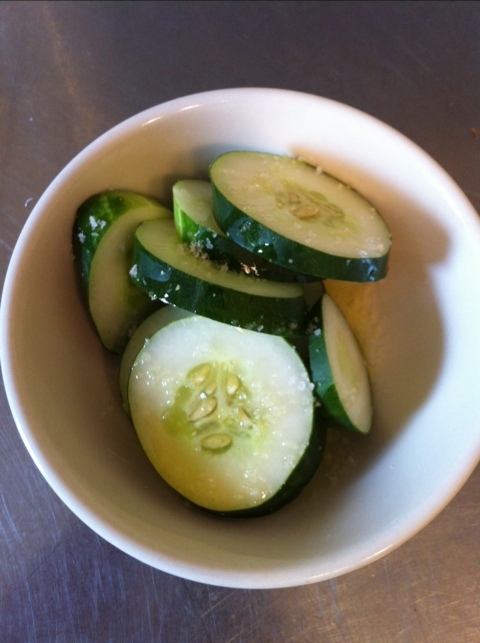 Thank you, revel garden, for the cukes. Evoo & fleur de sel compliments of the jolly green dollar. Nice looking cukes. I planted mine in a hanging flower pot in the same place as last year, except this year the plants are tiny and no fruit yet. These seeds were described as ‘hanging containers’, so I can only blame the weather. Just one more problem that came up this year. Thanks! Do you have pics? Did you get cukes from this spot last year? If you have pics, send them to revelgardener@gmail.com, and I’ll post to the site (if you’re not able to include in a comment). Yum, i’ve been eating my cucumbers from the garden in sandwiches. I use cukes instead of lettuce because I love the crunch.